Colton was unfortunately sick for Richie's birthday party and we finally got to see him again. 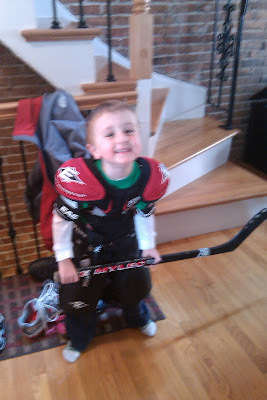 He is the absolute bestest friend.......he got Richie REAL hockey equipment for his birthday. LUCKY BOY!!! Not many shows that play at the Garden go by without at least a few of us attending. When we found out it was Toy Story 3 on Ice (both kids FAVORITE movie), we knew we all had to go......and get good seats. SO that is what we did! The kids were talking about it and excited for weeks. And of course we invited a few friends to go as well. You can see Colton in these pictures, but our friend Haley came as well. As for lunch afterward......one guess......Colton and Richie.......Beer Works! The four kids were so good and had a blast together. They all had hot dogs and after Colton was refused a beer (yes, he tried to order one! ), waters. I would take this bunch anywhere. Poor Linsey was quite uncomfortable.....just praying for this baby to come soon. Can't wait to meet new baby Larson! Since we hadn't been to a game in years, we decided to take the kids to a Clarkson/Harvard hockey game. It was such a blast I can't believe we hadn't thought of doing it sooner. The whole night went so smoothly.....even dinner with 5 kids and 5 adults! The Harvard arena is so small we were a part of all of the action. The Chitticks (Ainsley and Sammy) had never been to a game so this was the perfect way to introduce them to hockey. Ainsley tried her best to get the wave going, but I just don't think there were enough people there. Angela spent the night jamming out to the Pep Band. Yes, the Pep Band is the same as they always were......inappropriately hysterical. I didn't get any pictures of her, but Maddie was also there in her dress and purse! Richie had his first school dance and I am still a little speechless about it. It was....hysterical!!! Although it took him a while to warm up to the situation, he was a dancing machine once he got comfortable. Picture a room full of kids ages 4-7 with a DJ and sugary sweets. The DJ was at least 70 yet he played quite a few top 40 hits. There was also such classics as Yellow Submarine and Thriller (check out the video). No kids tunes at this kids party! And as you can see, Richie is the lady killer! Kaitlin is his love, but the other girls (Peyton and Anna in these pictures) were just all over him! Little holidays like Valentine's Day have become more and more fun with kids. It was especially helpful that our first day back to reality after vacation was Valentine's Day. Richie came home with bags full of cards from school and Angela was a little red fashion plate. The kids were so excited to open their presents although Richie's favorite present was a small hockey puck key chain and Angela just wanted her candy. After we made pizza for dinner together, we hit the chocolate! After a slow morning we headed out for an actual breakfast. The English Rose was high on a hilltop (VERY steep/winding/scary road to get there) with an amazing view of the ocean. The food was again, delicious! We then set off in search of a close beach that was calm. It took 2 stops and we wound up back at Sandy Beach where we started our first day. Since we had a huge breakfast we skipped lunch and just grabbed a snack at the Tamboo Bar. One of our favorite spots of the whole trip. We spent the whole afternoon at the beach and made it home just in time to make tacos (and amazing guacamole) for dinner. Before cleaning up the dishes we headed back out to the lighthouse to watch the sunset. Day 6 was topped off with ice cream in town. Day 5 was our most adventurous day. We finished date night the night before at a bar with Nora, a bartender from New Jersey. Nora has lived in Puerto Rico for 4 years now and told us all about her favorite day trip to the south shore of the island. When we heard this we immediately made her write it all down with directions and maps. The morning started with a drive south to Parguera. Although it seemed there were more roosters than people in this town (more about the roosters later), a man did ride up to us in a bicycle and opened his marina for us. After renting a little motor boat, we cruised around to check out all of the mangrove islands in the area. The iguana's truly almost jumped in our boat at Iguana Island. The water was the bluest we had seen so far. These pictures don't do this scene any justice. It was even more beautiful than it seems here. Richie was the skipper and drove the boat for us quite a bit. Since we had such an adventure the day before, we decided to spend today back in Rincon. We packed up and plopped ourselves at the Villa Cofresi. This beachfront resort had a pool and a restaurant so we were again happy for the entire day in one spot. Swimming, sand castle building and beach hockey for the kids. Rum drinks, lounge chairs and lunch on the ocean for the adults. For dinner we headed home to get ready for date night out. We had J Lo to sit for the kids (yes, her name was Jennifer Lopez and she said, "You know like J Lo!"). Once they were settled Chris and I went out to Guayabo's Tropical Sunset in Aquada for an authentic Puerto Rican fish dinner. Although we had already had some amazing food, this restaurant was out of this world! We watched the sunset over the ocean while eating Mofongo...heaven!